Great for your picnic or outdoor barbecue, this 3-piece Picnic Condiment Dispensers Set features squeeze bottles with flip top caps that stay on the bottle for easy resealing. 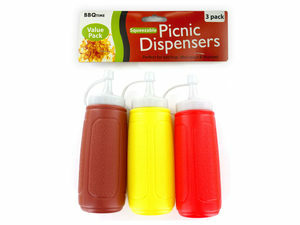 Each bottle is colored to match ketchup, mustard and barbecue sauces. Each dispenser measures approximately 6.5" high. Comes packaged in a poly bag with a header card.